That's what we call "dressed to impress"
Acer has shown a rather conservative hand for CES 2014. 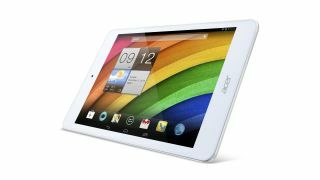 Most notably, the Taiwanese vendor announced updates to its Iconia line of Android tablets. The Iconia A1 and B1 series, both now running an aging Android 4.2.1 Jelly Bean, have scored new designs and upgraded components. First up is the Iconia A1-830, a 7.9-inch slate in a new silver, aluminum back cover and sporting a 1024 x 768 IPS touchscreen. Acer boasts that both of the new A1's cameras capture very high-resolution images: 1600 x 1200 up front and 2560 x 1920 around back. Inside the A1 is a 1.6GHz Intel Atom Z2560 processor and 1GB of DDR2 RAM. Despite that being a Clover Trail+ chip rather than the shiny new Bay Trail, Acer promises 7.5 hours of battery life. In addition to 16GB of onboard storage, the A1 comes packing a microSD slot for up to 32GB more space. As for connectivity, the A1 runs on 802.11b/g/n and Bluetooth 3.0. The asking price: $149 (about £90, AU$166) when it lands this quarter. The leading 7-inch tablets, Google's Nexus 7 and Amazon's Kindle Fire HDX 7, offer far better screens and specs albeit for a considerable 80 bucks more. Next up is the Iconia B1-720, a 7-inch tablet in a new, slimmer profile that's aimed at entry-level tablet users or children with its $129 (about £78, AU$143) price tag. For that, users will get a slate with one webcam up front and a touchscreen built using One Glass Solution technology. According to Acer, that technology allows for a thinner bezel and brighter screen, though the company is mum on resolutions and other specs. Inside, the B1 houses an unnamed (likely MediaTek) dual-core chip running at 1.3GHz and 1GB of RAM. Packing 16GB of storage that's expandable by up 32GB via microSD, the B1 is available in red and gray options for the front bezel, while the back remains a soft touch white material. For both of these tablets, Acer offers a number of accessories: a cover that folds into a stand and a thin, leather keyboard case (Bluetooth) for the A1, and a protection case for the B1 available in multiple colors. Acer promises a Q1 release for the A1-830, and that the B1-720 will launch this January in the US and Canada. And we'll see just how much of an upgrade these tablets received during CES 2014. Just after Acer announced its touchscreen Chromebook, the C720P, the company has unveiled new version of the budget laptop. This is the Acer C720P-2600, and nothing about it has changed other than its fresh, white (Moonstone White, Acer says) chassis.